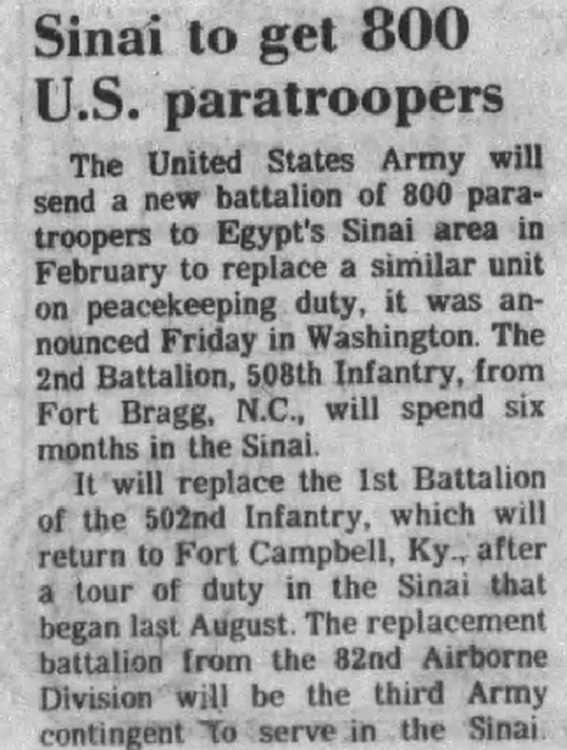 The United States Army will send a new battalion of 800 paratroopers paratroopers to Egypt's Sinai area in February to replace a similar unit on peacekeeping duty, it was announced Friday in Washington. The 2nd Battalion, 508th Infantry, from Fort Bragg, N.C., will spend six months in the Sinai. It will replace the 1st Battalion of the 502nd Infantry, which will return to Fort Campbell, Ky. after a tour of duty in the Sinai that began last August. The replacement battalion from the 82nd Airborne Division will be the third Army contingent to serve in the Sinai. Spec. 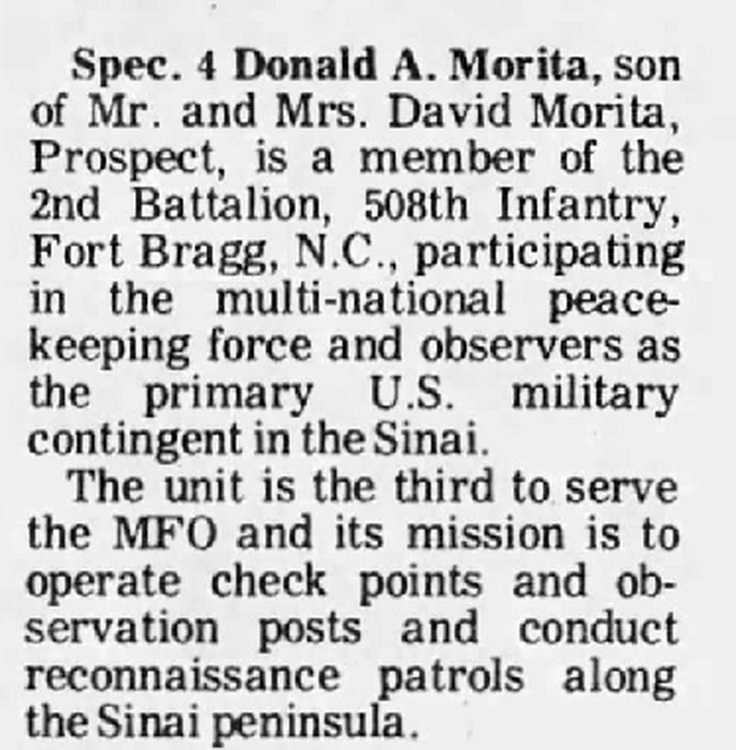 4 Donald A. Morita, son of Mr. and Mrs. David Morita, Prospect, [OH] is a member of the 2nd Battalion, 508th Infantry, Fort Bragg, N.C, participating in the multi-national multi-national multi-national peacekeeping peacekeeping force and observers as the primary U.S. military contingent in the Sinai. The unit is the third to serve the MFO and its mission is to operate check points and observation observation posts and conduct reconnaissance patrols along the Sinai peninsula. PRESTON --- Spec. 4 Wayne D. DeShields, son of Bernitta DeShields of here, is a member of the 2nd Battalion, 508th Infantry, Fort Bragg, N.C, participating in the multinational peacekeeping force and observers (MFO) as the primary U.S. military contingent in the Sinai. 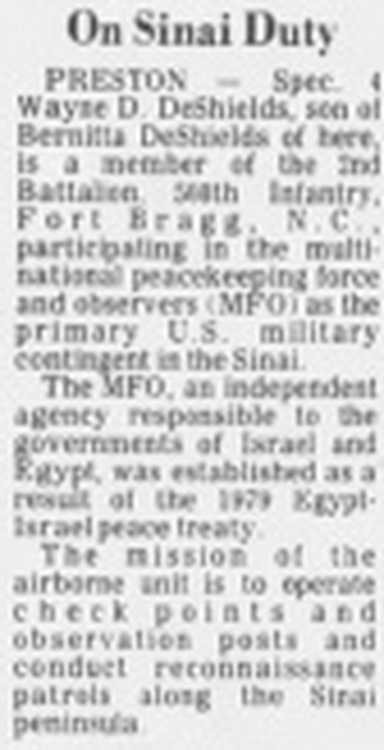 The MFO, an independent agency responsible to the governments of Israel and Egypt, was established as a result of the 1979 Egypt-Israel peace treaty. The mission of the airborne unit is to operate check points and observation posts and conduct reconnaissance patrols along the Sinai peninsula.